Schematic bow ties: not just for architecture geeks anymore. Self-tie with hook in the back for easy reuse without retying. Adjustable. Fits well for collar sizes between 14.25" and 17.5" -- i.e. one size fits most. 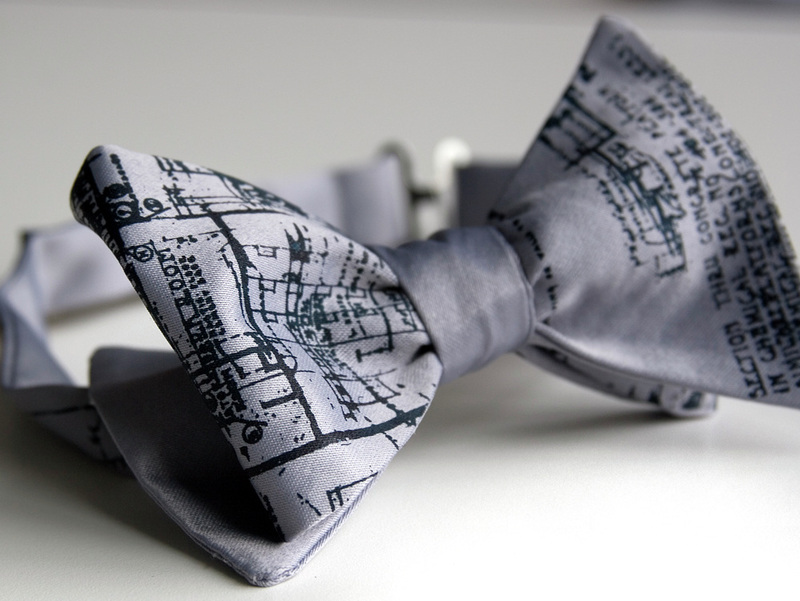 The Blueprint bow tie is a thing of beauty. Don't be intimidated by the fact that it's a non-traditional variant of an already atypical adornment. As with the Exhaust and the Topographical Error, a sophisticated and subtle print elevates this piece to a work of art -- much more so than the visual mash we tend to get from a lot of mainstream designers. The unusual but muted silver/navy color scheme of this bow tie is neutral enough to go with just about anything, which to some might sound safe. But I don't think anyone can call you a "safe" dresser while you've got this bad boy on. It's the nexus of adventurousness and taste, and you can't ask for much more out of a single detail. Sorry! This item is no longer available here.